Roland Studio Capture: front panel metering ahoy. 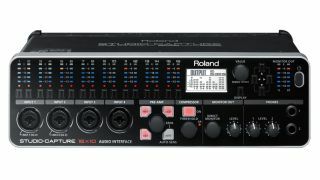 NAMM 2013: Roland has expanded its Capture range of audio interfaces with the Studio Capture, a USB 2.0 device that comes with plenty of I/O. You get 16 inputs, 12 mic preamps and 10 outputs - all in a relatively compact case. 24-bit/192kHz operation is supported. Check out the details below or find out more on the Roland Connect website. Price and release date TBC. STUDIO-CAPTURE is a high-performance USB 2.0 audio interface for studio and mobile production. With 16 audio inputs, 12 premium-grade mic preamps (a first for a compact USB audio interface) and 10 audio outputs, the STUDIO-CAPTURE provides extensive connection capabilities for professional production needs - and will fit easily into a travel bag. You also get 24-bit/192 kHz audio quality, comprehensive front-panel metering, XLR monitor outputs with dedicated level control, dual headphone outputs, rock-solid drivers with VS STREAMING technology, and much more. Durable, portable, and capable of handling large-scale recording projects in the studio and on the road, STUDIO-CAPTURE is the perfect audio interface for the modern musician. Combining professional audio performance with plentiful I/O options and a versatile mobile design, STUDIO-CAPTURE is a powerful solution for today's musicians, producers and recording engineers. Audio quality and connectivity options are equivalent to dedicated rackmount audio interfaces costing much more. As a compact interface, the STUDIO-CAPTURE is equally suited for travelling production, tabletop use in home studios, or permanent installation in commercial studios with the included rack ears. The 16 audio inputs, 12 mic preamps, and flexible monitor mixing allow you to track most bands without adding any additional hardware, or you can simultaneously connect multiple synthesizers and other devices in large-scale composing setups. For really big projects, you can seamlessly expand your I/O to 32 inputs and 24 mic preamps simply by adding a second STUDIO-CAPTURE. STUDIO-CAPTURE has 12 digitally-controlled mic preamps (called VS PREAMPS) made with premium-grade components for exceptional low-noise performance, high headroom, and transparent sound quality. 12 XLR/TRS combo inputs are provided for the preamps, with four inputs on the front panel for quick and easy access. Each channel also has independent phantom power, a low-cut filter, phase invert, and digital compression, all accessible via the included software control panel. STUDIO-CAPTURE has a total of 16 input channels and 10 output channels. Each of the 12 XLR mic inputs can alternately be used as a balanced/unbalanced ¼-inch line input. STUDIO-CAPTURE supports high-resolution, 24-bit recording at rates up to 192 kHz, with incredible stability and industry-leading low-latency USB performance using Roland's proprietary VS STREAMING technology. All current Mac and PC DAW platforms are supported through ASIO 2.0/WDM (Windows) and Core Audio (Mac) drivers. The VSSTREAMING driver also lets you expand your I/O by using two STUDIO-CAPTUREs on the same USB bus, without compromising stability or audio quality. The AUTO-SENS featurelets you quickly and easily set perfect input levels every time. Just press the AUTO-SENS button, play your connected instruments, and STUDIO-CAPTURE automatically sets the ideal recording level for each input in seconds. Useful for pros and beginners alike, AUTO-SENS is a great time saver, offering quick, fail-safe audio capture when recording a fully mic'd drum kit or an entire band. Bright, responsive LED meters let you instantly check your input, output and monitor levels, while dedicated input channel buttons make it quick and easy to get around. The MONITOR OUT section features a dedicated LEVEL knob for control room volume, plus a DIRECT MONITOR knob for listening to selected input signals. Two headphone jacks—each with their own level knob—allow a musician and engineer to monitor at the same time without additional hardware. STUDIO-CAPTURE also offers four independent Direct Mixers for zero-latency monitoring, operated via the software control panel. Powered by STUDIO-CAPTURE's internal DSP, each mix can be routed to any of the outputs, perfect for sending custom monitor mixes to headphones, speakers, or recording devices. Mix configurations can be saved for later use, providing quick setups for many different applications. A high-quality reverb processor is available for monitoring, allowing singers and instrumentalists to record dry tracks while listening to great-sounding ambience effects.